I’ve been a busy girl lately and have finished quite a few of my WIPs. Over the weekend I finished my Calvert. I love it and have worn it a few times already. I used a bit more than 10 balls of Sublime extra fine merino dk in the Colonel Mustard colorway. I wasn’t sure how about my choice of yellow but I’m very happy with it now. It’s nice to have something different than blue, black or grey. It looks great with grey and “grellow” just happens to be one of my current favorite color combination. 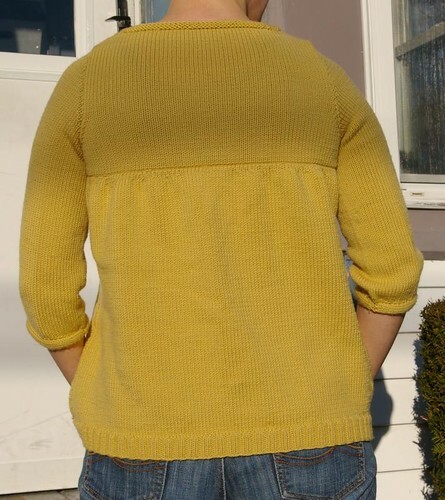 I modified the pattern a bit like so: I knit the 2 fronts and the lower back in one piece and I knit the sleeves in the round. Instead of binding off the lower back I put it on a holder until I was ready to seam the pieces together. In the pattern, the lower back is bound off, then gathered (it is wider than the back yoke) and then seamed together to the back yoke. Instead, when I was ready to seam I put the lower back back on a needle and decreased evenly so as to have about the same amount of stitches as the back yoke. I then bound off and seamed it together. I really wanted to do pleats but couldn’t figure out how to do it so instead did it that way. It took me 2 tries to get it how I wanted it but it was well worth it. My last change was to make button holes in one of the front bands so as to be able to button it that way instead of buttoning it through the lacework in the front panel as written. Another modification I made was to add 2 inches to the length of the body. I’m very pleased I did this, although I wish it was even a bit longer. I haven’t wet blocked the cardigan yet though, and I might be able to get an inch more if I did that. I ended up using the antler buttons that I bought at Stitches East, even though I tried many other options, it was still the best combination. Last year I knit the Hourglass sweater, and although it fits well enough, I haven’t worn it much. I find that this cardigan works much better for me and will get a lot more wear. I enjoyed knitting with the Sublime extra fine merino dk, even though the woven in ends keep sneaking back out. I don’t know yet how it will wear but have high hopes for it. I definitely would work with this yarn again. Now I’m thinking of my next sweater… but first I have to finish a bunch of socks! Nice! I love the color and the length looks great! It’s great! I think the modifications are really good too. The sweater looks great! Nicely done. Yellow wouldn’t have been my first choice (mostly ’cause I can’t wear yellow although I love it) but it’s a good color for that cardigan. Congratulations on the FO! Hate it when the woven ends don’t stay put. I’m going to have that problem with my current project. The sweater looks great – I’ve been thinking of casting it on. The sweater looks great! I like the mustard color. Love the sweater, there is something about a good cardigan that makes it superior to a standard pullover in my mind. I really like your sweater, the color is great! love the color! And great mods too, lovely buttons.